Fran Jurga`s Hoof Blog: News from Hoofcare + Lameness: Laminitis Research: Is IGF-1 the missing link between insulin and laminitis in the horse's foot? Note to US readers: In other countries, the anatomical terms "lamella" or "lamellar" are used instead of "lamina" and "laminar", which are commonly used in the USA. Please substitute the US terms as needed as you read this article. The study, conducted by the University of Melbourne’s Faculty of Veterinary and Agricultural Science in conjunction with the WALTHAM® Equine Studies Group, investigated the effects of insulin on the equine hoof in the laboratory. It was recently published in the Open Access research journal PeerJ. High levels of the hormone insulin have been known for some time to cause acute endocrine laminitis, the most common form of the condition seen in ponies and certain types of horses. When these animals graze lush pasture or consume a starch- or sugar-rich diet, or when they develop pituitary pars intermedia dysfunction (PPID or "Cushing’s syndrome"), they frequently suffer from laminitis. Many ponies and horses at risk of the condition produce large spikes of insulin in their blood stream after consuming meals high in non-structural carbohydrates (in particular starch and simple sugars), which indicates that this could be the way in which they succumb to acute endocrine laminitis. The mechanism by which insulin, a metabolic hormone known best for its role in clearing glucose from the blood stream, can cause changes in the foot leading to laminitis has been the subject of much debate in recent years. Hormones like insulin must interact with a specific receptor on the surface of cells in order to produce an effect. Laminitis occurs when the lamella--a network of delicate interlocking tissues that bond the hoof capsule to the distal phalanx (or "coffin" or "P3") bone of the foot--sustain damage. The foot's lamellar cells give strength to this tissue. A change in the growth or structure of these cells weakens the hoof-to-bone bond and causes laminitis. What has confused researchers is that there appear to be no insulin receptors on the hoof lamellar cells. How did insulin cause damage to these cells in the horse's foot? The Australian researchers considered the close similarities between insulin and another hormone called "insulin-like growth factor -1" (IGF-1). There are receptors for IGF-1 on the lamellar cells, and the researchers speculated that high concentrations of insulin might be able to cross-stimulate these cells by activating the IGF-1 receptors. To investigate this possibility, Melbourne doctoral candidate Courtnay Baskerville, together with Professor Simon Bailey, developed a method for culturing lamellar epithelial cells in the laboratory, and incubated them with increasing concentrations of insulin. They found that high concentrations of insulin stimulated the IGF-1 cells to proliferate. Furthermore, this effect could be prevented using an antibody that specifically blocks only the IGF-1 receptor. Further downstream, effects within the cells were also shown. The changes seemed to occur mainly at very high concentrations of insulin. Similar concentration levels can be seen in ponies and horses with insulin dysregulation linked to Equine Metabolic Syndrome, but are not commonly seen in normal horses that are considered to be at lower risk of laminitis. Further work will determine exactly how these cellular lamellar tissue changes induced by sustained high insulin concentrations might cause laminitis. However, it seems that targeting the IGF-1 receptor may be an option for developing new drugs to prevent and treat laminitis. Article citation: Baskerville C.L., Chockalingham, S., Harris, P.A., Bailey S.R. (2018). The effect of insulin on equine lamellar basal epithelial cells mediated by the insulin-like growth factor-1 receptor. PeerJ 6:e5945 (DOI 10.7717/peerj.5945). Because PeerJ is an Open Access journal, this research can be seen, read and downloaded by any interested parties. This link: The effect of insulin on equine lamellar basal epithelial cells mediated by the insulin-like growth factor-1 receptor will take you directly to the research article. This research was indexed in the November 2019 edition of HoofSearch, the online index of equine hoof (and laminitis) papers, proceedings, and patents. 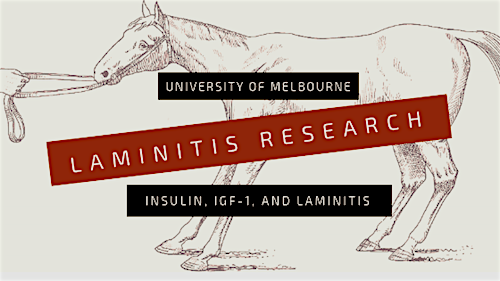 Visit the University of Melbourne's research page on laminitis inflammation and metabolism as well as its page of Professor Simon Bailey's endocrinopathic laminitis research. Information for this article was provided by the University of Melbourne and WALTHAM®, a leading scientific authority on the nutrition and health of companion animals. Top background image is from Elementary lectures on veterinary science for agricultural students, farmers and stock keepers by Henry Thompson, published in 1903 in New York by W.R. Jenkins. The image may be found on Wikimedia Commons.